The U.S. Army has raised the mandatory retirement age for active duty soldiers to age 62, from age 55. The Army also raised the maximum enlistment age to 39, from 34. 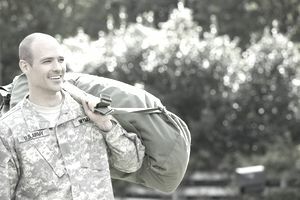 That change to the maximum retirement age allows soldiers who enlist at ages above 34 to obtain 20 years of service, which is required in order for a soldier to be eligible for full retirement benefits. The Army, Navy, Marines, Air Force and Coast Guard all set their own policies, so the maximum age for service varies slightly in each branch, and even for different ranks within a branch. For instance, for U.S. Marines the mandatory retirement age is 62, although some higher-level officers and specialized personnel can serve until age 68. The policies change frequently, too, based on military needs and budgets. For example, in 2018 some Air Force colonels were invited to stay on for three years beyond the mandatory retirement mark, which is usually 30 years of service. It also is possible to apply for a waiver of the mandatory retirement age. How Old Can You Be When Enlisting?